[Disclaimer] The views in this post are entirely my own and I do not, in any way, represent Cookie Clicker and/or its creator Orteil. The purpose of this article is analytical and educational in nature. 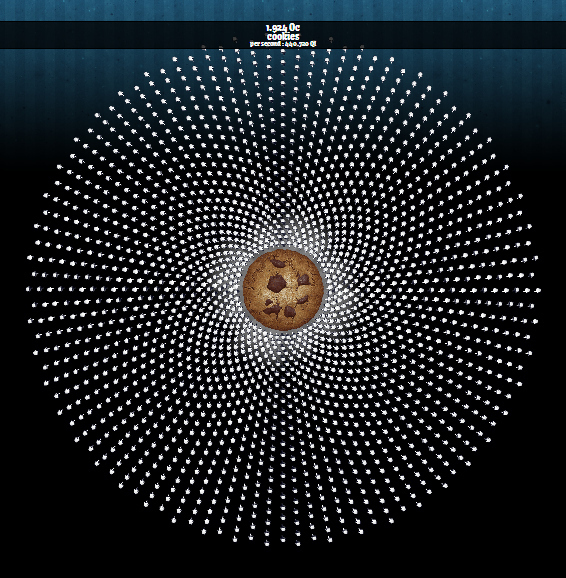 In the game Cookie Clicker you click cookies. For every cookie click, as you might have guessed, the player receives a cookie. With the obtained cookies, the player can purchase things that help generate cookies more rapidly. Initially, the player can start with purchasing cursors that help with clicking on cookies but before long this escalates into obtaining cookie farms, factories, mines and many other ludicrous cookie generators. Eventually, the game even lets the player research upgrades to increase cookie production. For all the cookies, cookie generators and upgrades obtained the player can gain achievements. The game tracks many statistics that will accompany the player's ever expanding cookie empire. Cookie Clicker is a game I admire and despise for what it is. Admiration for turning the simple act of obtaining a cookie into an addictive, attention swallowing, experience. On the other hand I view it with contempt because it boils down the intricate beauty of a game experience to its baser form of unglamorous positive reinforcement loops that provide the player with artificial confidence and unabiding satisfaction. In an attempt to better understand the game, I will highlight parts of Cookie Clicker and explain how I think they contribute to the addictive nature of the game. Creating an account is not a prerequisite in order to start playing Cookie Clicker. The absence of account creation and log-in system saves the player from the laborious task of setting up a new account, confirming the email address, and logging in before finally being able to play. Ironically, the game periodically saves your session with nothing other than, you guessed it, cookies. The lack of registered and password protected accounts also has its drawbacks. Cheating, for example, becomes incredibly easy. However, cheating will give you an achievement which sort of acts as a way to brand frauds, making the obtained achievement much less commendable and valuable. As long as a browser window is kept open with the game running, the cookies will keep coming in. The browser tab will even display the amount of cookies you have. A common play style is to keep the browser tab open while doing other things only to come back occasionally to spend those cookies. In contrast to games such as Farmville or Cow Clicker, this means the player needs to stay in the game in order to progress without being required to actively play. Every cookie, achievement, cookie generator, or upgrade the player obtains will come with visual feedback. 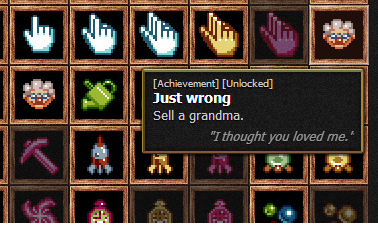 Obtaining cookies makes cookies fall from the sky, achievements and upgrades each have unique individual descriptions and graphics, and cookie generators become more ridiculous per tier as they are accompanied by new cookie generator graphics. As an extra touch to enhance the cookie universe, the game also features a fictional news feed that ties in with the cookie events in the players world. The information the player might need to play the game is presented pleasant and transparent. The interface is hardly ever frustrating and manages to create a smooth user experience. Game data such as costs, income, quantity, descriptions, and overall statistics are presented clearly and concise. As mentioned before, I have yet to find a person that does not know what to do from the very moment they land on the website. Each and every cookie is there to make the player feel good about obtaining them. The game hardly ever takes cookies from the player unless something is purchased or a randomly appearing golden cookie is clicked. For the player, the game does not have much to lose and everything to gain. From experience, it feels good to see how many cookies I have and how many I gain per second. It feels good to buy another cookie generator or upgrade. Each obtainable object in the game feeds the player's curiosity and leaves the player wanting for more. The method by which the player is fed all this psychological joyfulness is a familiar one. Obtaining each reward takes just a little bit more effort than the last one. The reward distribution seems to follow an exponential curve where the initial 5 minutes of play showers the player in feel-good moments. However, as the game progresses these satisfactory moments get scarcer and make way for a sense of achievement and accomplishment. The moment the player realises the silly and addictive nature of the game, is usually the moment when the game stops feeling good to play. I think that the player does not so much consciously decide when to stop, as much as that the mind is over saturated with the experience. I wonder if Orteil consciously crafted this addictive design, if he was inspired by other games similar to it, or if the concept of the game just sounded fun and silly enough to make. Cookie Clicker has end-game features such as a prestige system which grants the player heavenly cookies upon resetting the game. Orteil as also announced that a future update will feature some sort of dungeon system. Furthermore, the game includes a couple of incredibly difficult to obtain achievements which will keep the achieving players busy for a while longer. Is Cookie Clicker a one-click pony or is it here to stay? 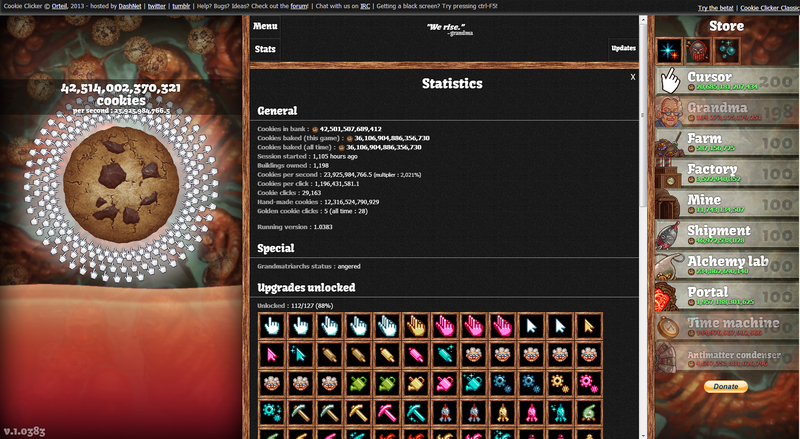 Hopefully this article has been able to provide insight into the addictive nature of Cookie Clicker. At the time of writing I have not been able to find data that indicates how many people are playing Cookie Clicker but if Google Trends is anything to go by it is doing quite well for itself. In the graph below, the blue peaks consistently appear each year around December where my guess is that it demonstrates the demand for cookies around the holiday season. Oddly enough, a wild peak appears in September, 2013. Coincidence? I think not. Note: Gamasutra does not support embedding of Google Trend graphs. Please visit this link for an actual graph.